The past 24hours has been a terrific user experience for all WhatsApp users on iOS and Android. As you are all aware, the messaging app is plagued with a major bug that allows users to message you even after you’ve blocked them. The most annoying part of it is that the bug allows blocked contacts to see your status and profile details as well. However, WhatsAp p Inc has acknowledged the bug. “We are aware of the issue and are rolling out a fix,” the company said. 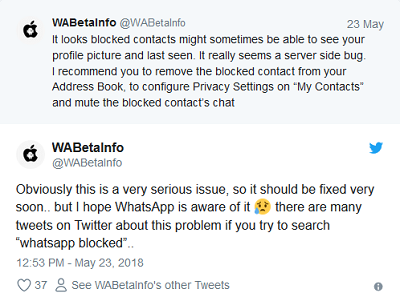 But before then, you can easily fix this before the company roll out a fix by unblocking the contact and block them again. Hmmmmmmm are you sure it’s normal WhatsApp? has it always been like this or the bug came with one of the app update? You have spoken as a true coder, hail to thee, thou art been found loyal to thine cause.